I mentioned in my last post that Taylor's sensory issues have become much more prominent in the last 6 months or so. 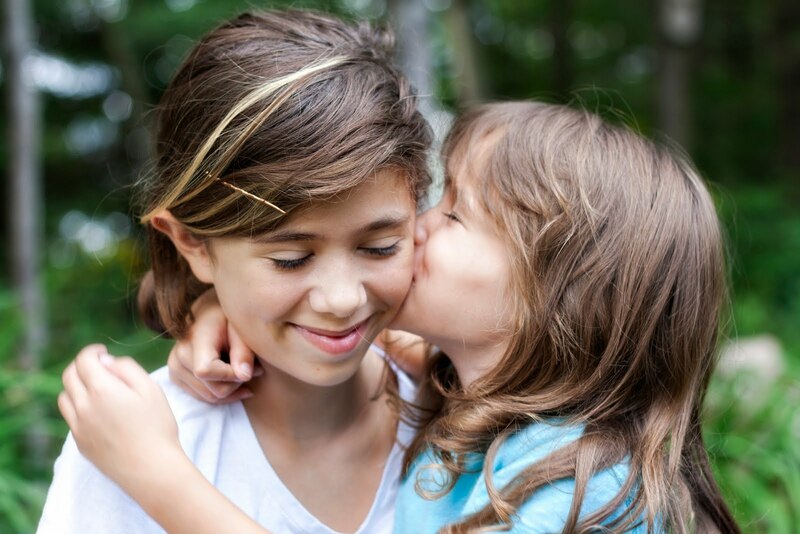 I'll be blogging more about Sensory Processing Disorder as I have time, but for now I want to share a tool I developed for us to have more structure and less meltdowns in our day. Taylor is a child who thrives on control. 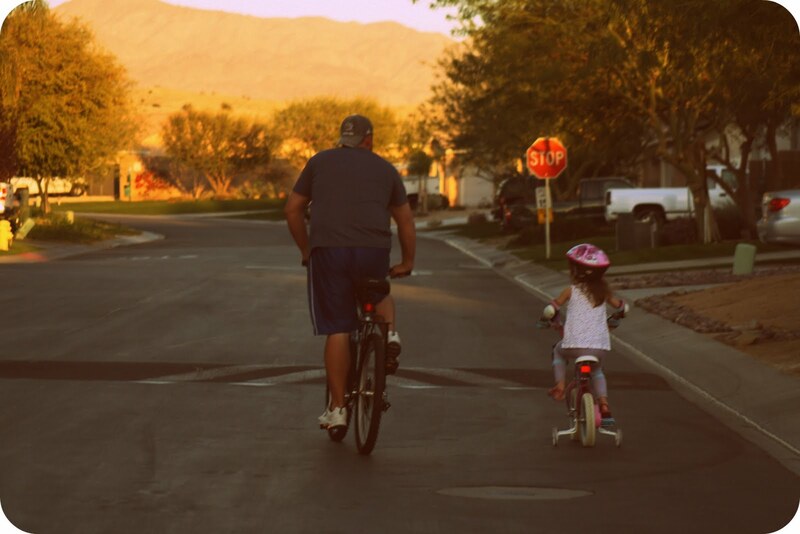 I know all children benefit from structure, but for Taylor, when her routine is out of whack and she doesn't know what to expect next, it sets her up for anxiety, uncertainty and horrible behavior. We had an occupational therapy evaluation last week to help us diagnose and treat the Sensory Processing Disorder that we see emerging with Taylor. One of the suggestions the OT had, was to have more structure in our days. The caveat, of course, being that all kids need time for freedom and free play. I've been wanting to create a routine chart and a behavioral/reward system for Taylor for quite some time, to give her an added sense of control over her day. So, after looking at various resources, I found Sparkle Box. They offer 1000's of free printables. 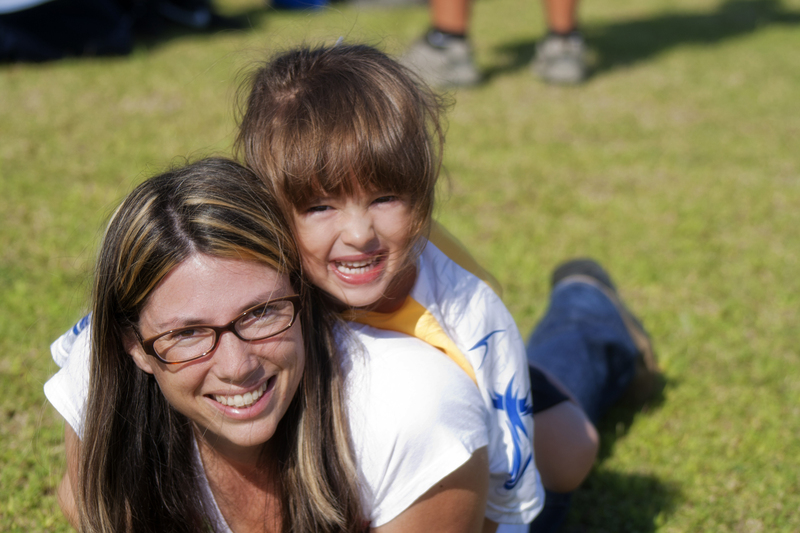 While most of their resources as aimed at teachers and education, they also have a section for parents and homeschooling. I printed off their daily routine cards, and cut out the ones that apply to us. I then used my Xyron machine and laminated each of the cards. I included a heading that identifies the day of the week, under that I added what time of day/routine we were working on: Morning, Afterschool, Bedtime. Finally, I went through our routine and the basics of what needed to be done at each time of day and wrote it out on paper to help me organize the cards. This also made me realize that I need to make or find other cards for activities that weren't included in the set I printed. For example, I'm working on having Taylor take more responsibility for household chores, so I need cards that say "set the table" and "fold laundry" and "clean up toys". I also need to create some custom cards that include photos of her medications (asthma and allergy) and some of her sensory activities. You can see from the photo above that we don't have a picture to show the task of getting dressed. We'll be adding that! Once I had the cards organized, I added velcro dots to the chart and the cards. I was able to determine that at this point, each of our routines has at most, 6 steps, so their are 6 velcro stickers that stay on the board and the cards are attached and removed as the routine is completed. 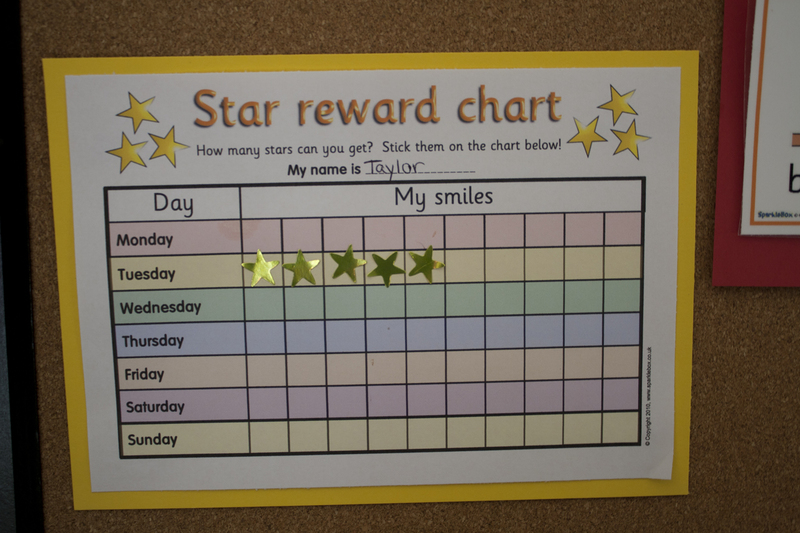 Other ways she can earn star stickers is by following her rules, and then there is opportunity for us to give her stickers for random good behavior. This makes us more aware of catching her being good. After a week of accumulating lots of stars, on Fridays she will get to choose one thing that she wants: either McDonald's, Wendy's, Dairy Queen or Starbucks. 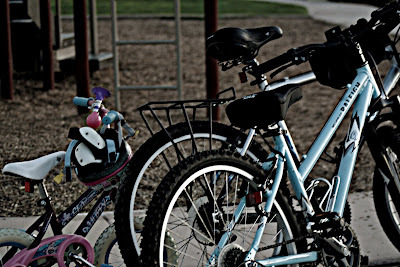 Now, I'm really not fond of offering food as rewards, but when Taylor outgrew her food allergies, we got in the bad habit of often grabbing fast food on the way home from school. This soon turned into her expecting fast food everyday. 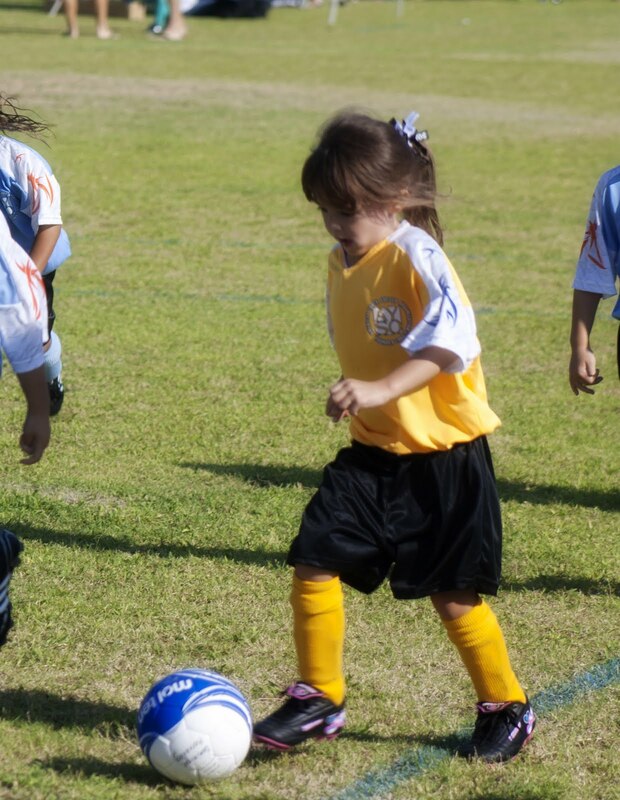 When I refused her requests, a major tantrum would ensue. So, the new rule is she can have fast food once a week, only on Fridays and this eliminates the daily battle. I also added a calendar to the chart so we can see upcoming events and talk about them, count down the days until they happen, etc. Finally, I added a place for reminders and important notes/papers. Our fridge is not magnetic and so we can't use it as our central command center. 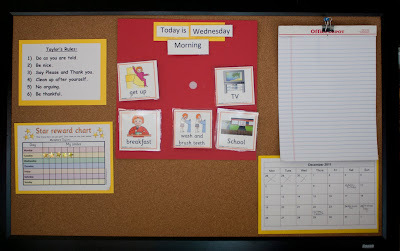 This bulletin board is a great place to keep track of all the little things that I need to see or they get forgotten. I'm sure I'll end up making changes to the board as we figure out what works for us. But, so far, Taylor loves the board and she's responding really well to the structure and knowing what's going to happen next. 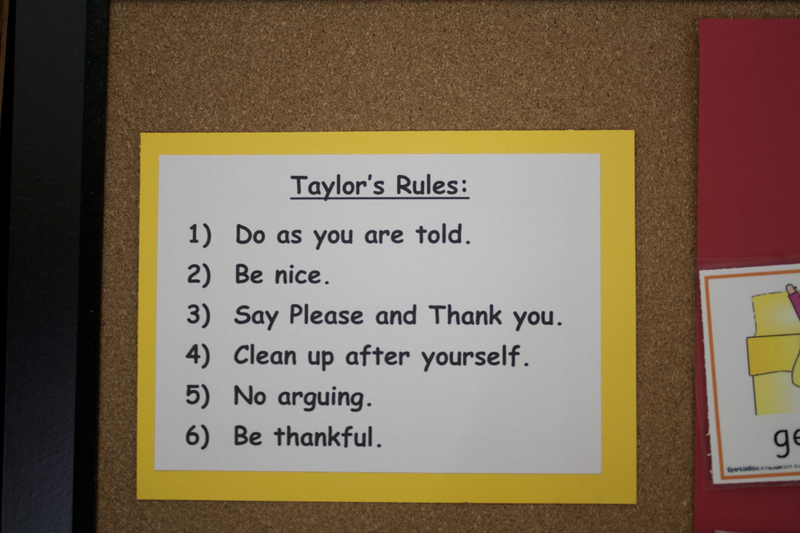 A few weeks ago, during a very trying time of behavior problems, I wrote out a set of rules for Taylor. I decided to include the rules on her routine board and under the rules, I added a star behavior chart that I printed from Sparkle Box. I then purchased star stickers at the dollar store. 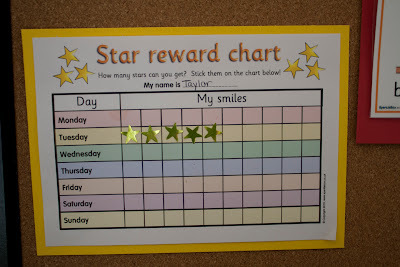 There are 10 spaces for stars on the chart each day. At this point, Taylor gets one star for following each of her routines without a big fight. 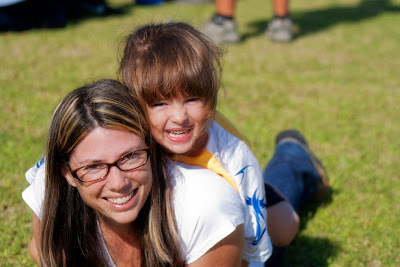 I give a little bit of leeway with "not a big fight" because I recognize that I have a very, very strong-willed child. I also like that she's assertive and I recognize that one of the rules she struggles with the most, is rule #1 Do as you are told. She's just not that compliant of a child (at least not at home!). That's not her personality. She often needs to do things "her way". So, as long as she follows her routines without a "big" fight, then we're happy and she gets a sticker. Our system has quickly become an activity in itself. Taylor likes going to the board to see what's up next, she takes the cards down once she's completed the task, and she's responding really well to the star sticker system. Do you have a system like this for your child? I'd love to hear how you manage routines and behavior in your home. 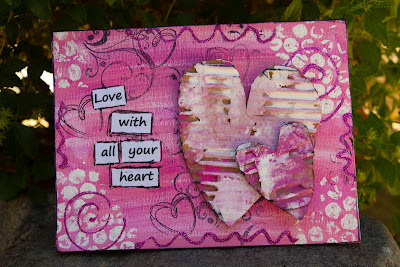 I am SOOOO excited to start the She Had 3 Hearts Art Journaling workshop today! Of course, I have to get through my workday first, and then head to Taylor's first swimming lessons, and then sometime mid-evening, I'll be able to take a peak at all the goodness and then I'll really delve into the videos after Taylor's in bed and I have some uninterrupted time to watch the videos. Anyway, now that I seem to be on the mend, I'm definitely looking forward to playing in my journal and absorbing all the creative juice that Christy has to offer. If you'd like to join the workshop, there's still time! 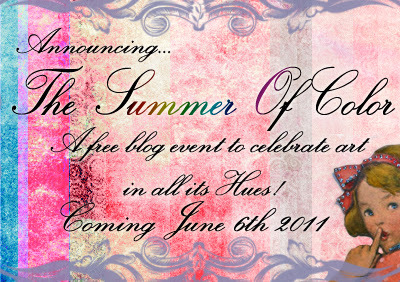 Just head on over to her blog and read this post and register. After my experience in her She Art Workshop, I can tell you, Christy does not disappoint! I'm still working on my collection for The Summer of Color, as well, but I haven't finished my red or brown piece. I'll get back in the groove and post and then link back up with this week's color of Purple! And of course, you can always join in on The Summer of Color, still, too! She Art - My FIRST finished She Art Girl! 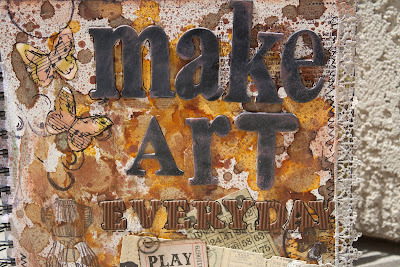 A couple of months ago I registered for Christy's online She Art Workshop. I discovered Christy and her workshop through Donna Downey. You all know about my love affair with Donna. Well, while I'm still loving Donna, I have a new crush on Christy. She is SO inspiring. Through her amazing workshop, I've learned about all kinds of art products and a ton of new techniques. She has really sparked my new passion for ART. Real ART, not crafts and sewing, but actual ART. So, although I wouldn't say I was intimidated to create a piece inspired by Christy, I just haven't had a clear idea of what I wanted my first girl to look like. After watching the first video several weeks ago, I created one that was of a little girl, and Taylor quickly declared she wanted the faceless girl with no hair to be her, so I added hair and a few details, but the canvas still sits on my shelf, unfinished, several weeks later. Well, I was suddenly hit with a desire to create and complete my first She Art canvas. I absolutely LOVE how it turned out. In fact, that's an understatement. I realize I should probably be a little (or a lot!) more modest, but I think this may very well be the most beautiful thing I've ever created (with the exception of Taylor, of course! ;) ). Goodness, if this is the first post you're reading on my blog, please know that I'm not usually this arrogant!!! When I think of yellow, I think of sunshine! 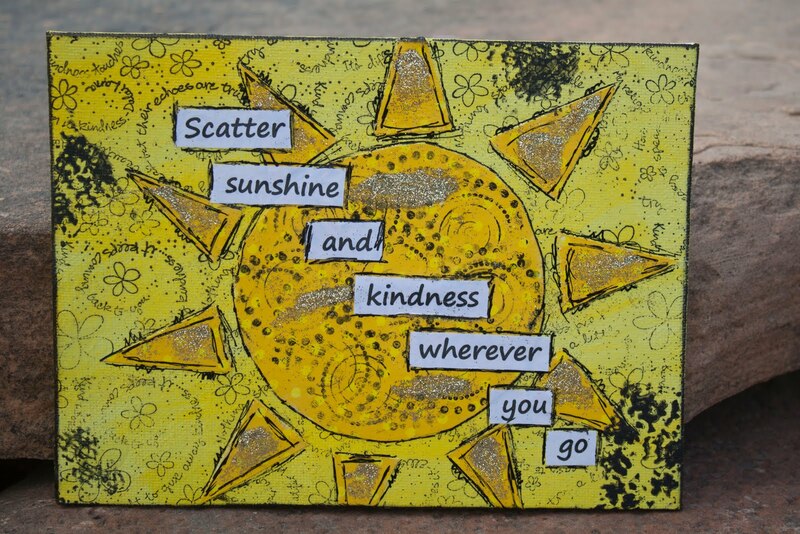 In keeping with the inspirational theme of the whimsical canvas collection I'm making for Taylor, I created a canvas for this week's Summer of Color challenge that is all about scattering sunshine! I painted a 5x7 canvas panel with various shades of yellow acrylic paints. I then used a stamp wheel and created the black stamped images. Next, I cut the shape of a sun with triangular rays out of yellow paper with white polka-dots. I wanted the paper to be brighter, so I painted it a brighter yellow. I glued the sun down to the panel using Mod Podge. I then painted a small piece of rubber shelf liner with black paint and blotted it randomly on the edges of the panel. Next, I glued down the sentiment using more Mod Podge. 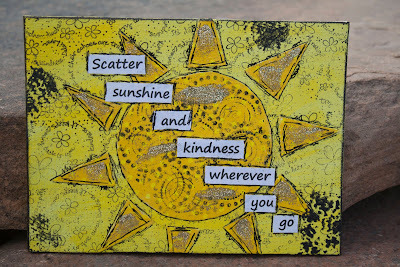 Finally, I added gold glitter to the sun and some doodling and outlining. We're off to a party with friends, but I wanted to wish everyone a safe and happy 4th of July! I was inspired by my friend Jen to make a junk journal. I recently bought a Bind-it-All and I am absolutely IN LOVE with it. How did I ever survive before without one of these? 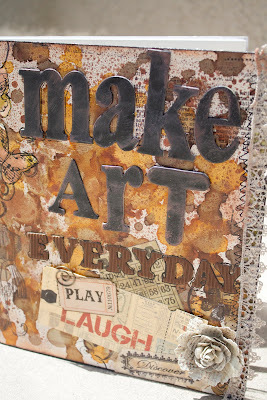 ;) So, my junk journal is a handmade art journal that I created using all sorts of odds and ends. There are sheets of standard papers like watercolor paper, white cardstock, lined notebook paper, copy paper, and graph paper. I also included shipping tags, manilla envelopes, greeting cards, scraps of patterned papers and other odds and ends. Once I had my journal put together and bound with my Bind-it-All, I needed to decorate the cover. Prior to binding it, I had gesso'd the cover and adhered a text patterned paper to the front using dry adhesive tape. I then covered over the paper using watercolor crayons and added water. I ended up hating what I created so I tore the paper off the cover, which resulted in a peeled paper look, adding cool texture. Oh happy mistakes! I then painted the cover with cream paint and randomly dropped alcohol ink. I used latte, ginger, butterscotch and caramel alcohol inks by Ranger. I then stamped various images using black archival ink. 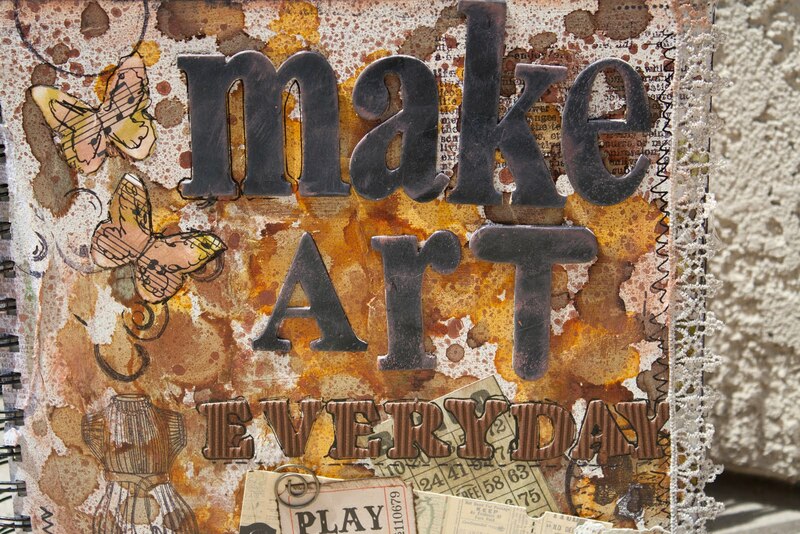 The title was created by painted various chipboard letters black and then inking them with brown chalk ink. 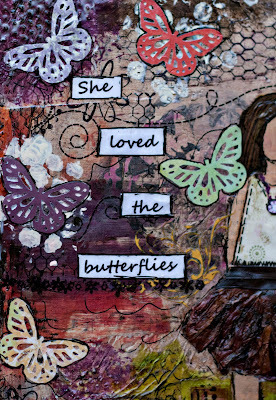 Finally, I punched butterflies out of sheet music, and added the 7 Gypsies vintage ephemera. I stamped the word "discover" on masking tape, then inked the tape with distress inks and taped it to the cover. I then added the lacy trim and flower for a feminine touch. I'm SO happy with this finished product. This journal is going to be a place for me to play freely and learn new art techniques. I can't wait to fill it with artsy goodness! Oh, and when Taylor saw it, she asked me to make one for her, too. I'm so excited to start art journaling with her. 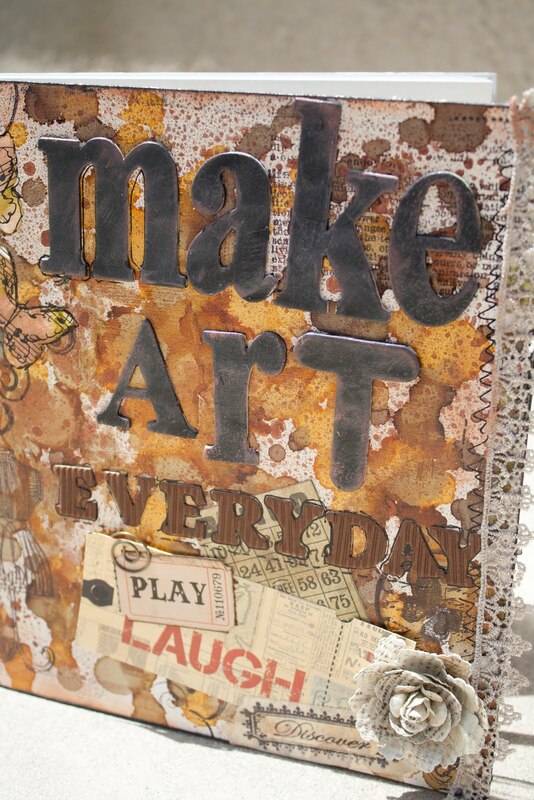 Do you do art journaling? What kind of a journal do you use? 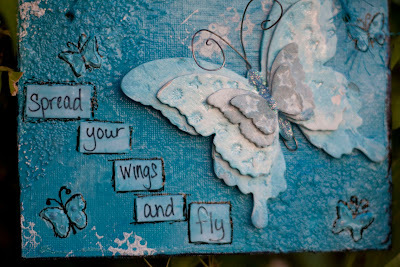 Where do you find inspiration for your journaling. Better late than never! 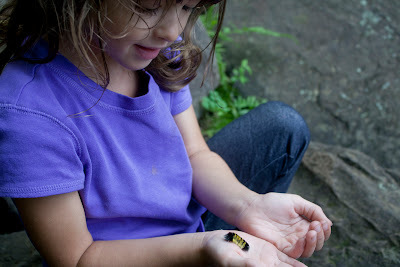 I'm participating in The Summer of Color, hosted by Kristin at Twinkle, Twinkle. I finished my pink piece but took awhile to actually post it. So, now without further ado, I'm revealing my piece for this week, inspired by the color pink. I wasn't totally in love with my green piece from last week, but I really like how this week's piece turned out. I am creating an inspiring colorful collection which I had planned to display in my studio. But, after Kristin's comment last week, I've decided the completed collection will be displayed in Taylor's room. And, even though I was a little late in posting this, I've already completed my yellow piece which will be revealed next week. I've had a busy week, so now I'm off to catch up on what the other artists have created in honor of the color pink. I created this piece for week 2 of The Summer of Color. Remember, I'm creating a collection of canvases, each one representing a different color. There's another theme that is emerging, here and when the collection is complete, I'll reveal what the underlying theme of the collection is. It makes me giddy every time I envision the finished collection hanging in my studio. I'm so glad Kristin created this event, because I never would have thought to create this collection if she hadn't. To create this piece, I painted a 5x7 canvas panel with layers of various shades of green (including citron - so I completed the bonus challenge). I then cut a trunk shape out of woodgrain patterned paper. Once I had the tree trunk glued down, I tore bits of green cardstock in various shades of green (including citron). 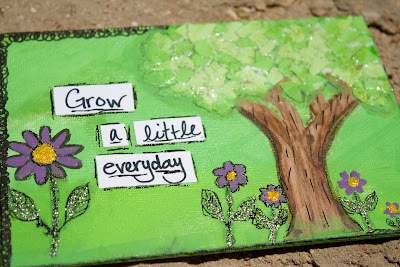 I then glued them down to the canvas using Mod Podge to create the leaves on the tree. The flowers were created using stamps and paint. I then added yellow Stickles to the centers of the flowers and green Stickles to the stems and leaves of the tree. Finally, I finished off by shading a little bit with my Big Brush Pitt Pens and added some doodling and the words. 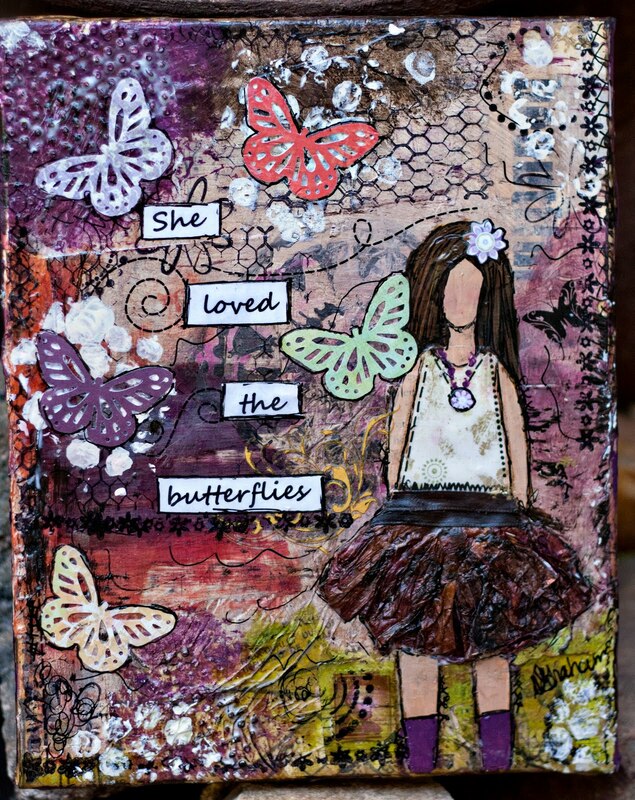 I like the whimsical feel of this piece. Finally, I want to tell you how appreciative I am of all the comments on my last Summer of Color piece. I'm thrilled to have so much positive feedback. There's an incredible group of artists participating in this event and I'm happy to be one of them. I'm off to link up and check out what everyone else has created this week! Remember, you can join the party anytime! Taylor, like most 5 yr old girls, absolutely loves fairies. She's watched the Tinkerbell movie countless times, and after talking about fairies all day today, I've realized, I don't think I've ever watched the whole movie. 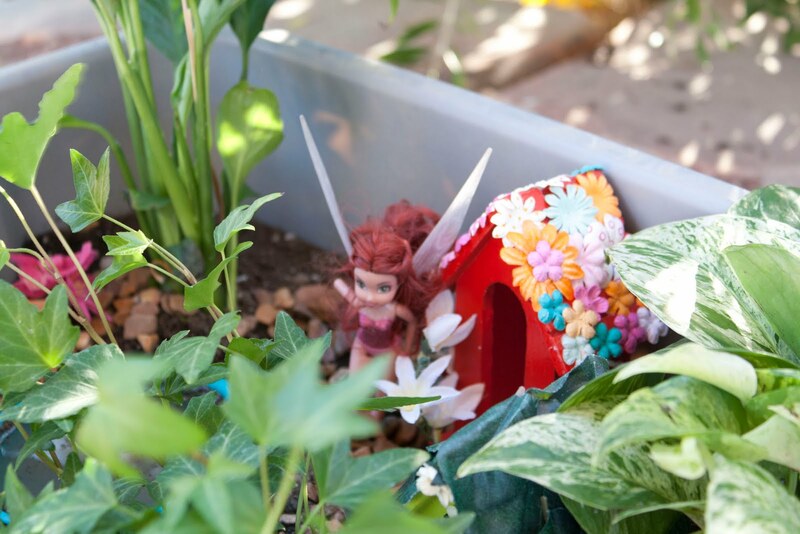 Anyway, knowing how much Taylor loves fairies, I was inspired to create a fairy garden with her. 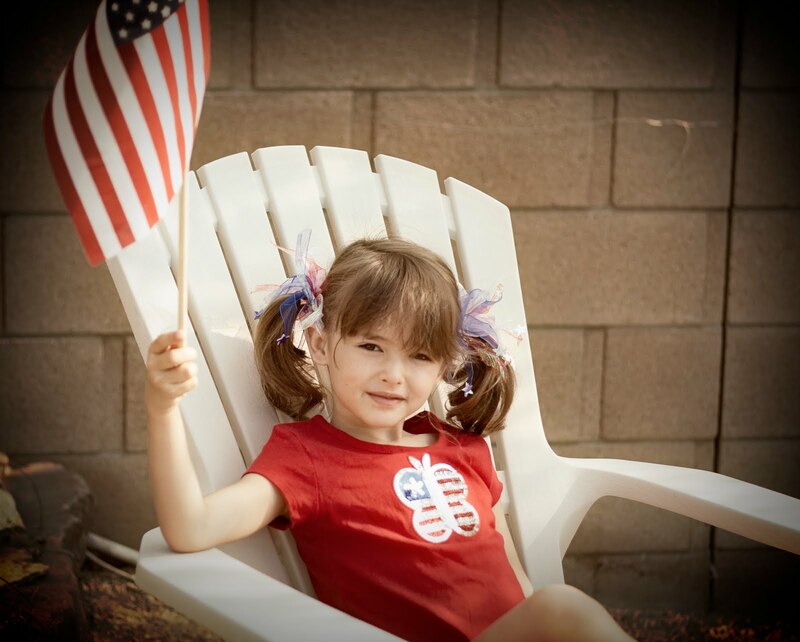 The inspiration for this perfect weekend project came from Lil' Blue Boo. The fairy village she created is absolutely adorable! Be sure to check out her tutorial for step-by-step instructions, supply details and another variation on decorating the houses and the village. We spray painted and decorated each house to match the fairy who lives there. That was Taylor's idea ;). Rosetta is Taylor's favorite fairy because she's red. She's a flower fairy, so, naturally, I love her, too. We glued colorful flowers to the roof of Rosetta's house because we're certain that's how Rosetta would like it. 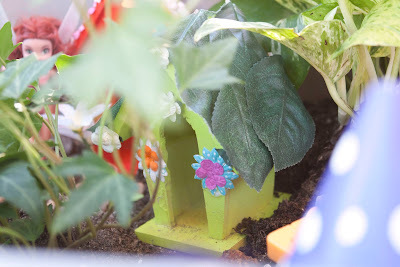 The green house, is Tinkerbell's house, of course. And, Tinkerbell is buried among other toys somewhere in our house, so until she is found, another tiny doll has taken up residence in Tink's house. I don't think she'll mind, do you? 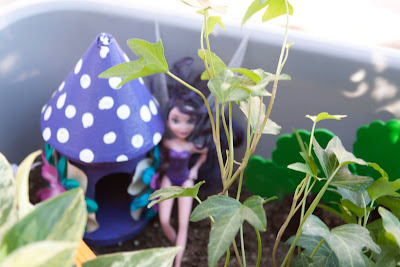 We decorated the roof of Tink's house with artificial leaves, because I thought that looked so cute in LBB's garden. Vidia, is a pollen fairy. She has huge flowers on the side of her house with glittery pollen in the centers ;). We had to make whimsical polkadots on her roof just because Taylor loves polkadots. Who doesn't, really? We created the dots by dipping an eraser on the end of a pencil in white paint and then dabbing it on the roof. Taylor and I had so much fun playing with the fairies today! I'm sure we'll spend some time tomorrow adding a few other whimsical details. 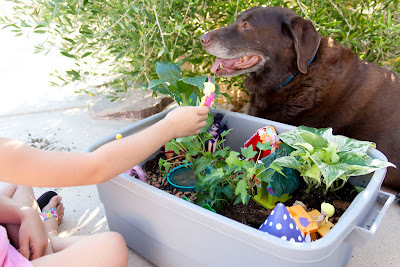 The added fun of this project is that she's always wanted to plant a garden and she LOVES that the plants are real and they'll grow! She's a little disappointed, though, that the plants have been in her garden for several hours and she's given them lots of water, but they still haven't grown yet! When I explained that we won't be able to see the plants grow, she said "Oh, because they know we're watching them? Maybe we shouldn't watch them." This is my submission for week 1 of The Summer of Color hosted by Kristin at Twinkle, Twinkle. I had so much fun creating this piece. Turquoise is my most favorite color so, of course, my blue piece would be covered in turquoise ;). I started with a 4x6 canvas board and just started playing. 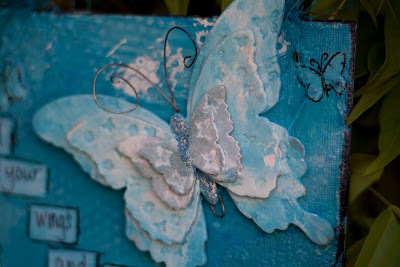 I created my own version of glass bead gel using gel medium and Martha Stewart micro beads and I created the tiny butterflies in the corners using a Martha Stewart butterfly stencil and modeling paste mixed with turquoise paint. 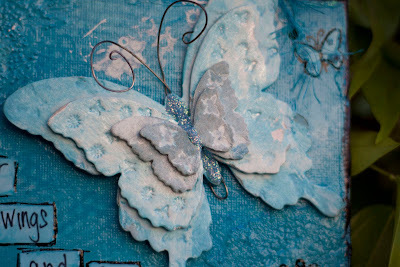 The focal point of the piece is this detailed, layered Chip Art butterfly. Melody Ross' Chip Art collection by GCD Studios is one of the many new creative discoveries I made when I was on my unintentional blogging hiatus. You will see LOTS of chip art showing up in my art now. I also took an on-line workshop with Christy Tomlinson and used some techniques inspired by her in the piece as well. (More to come on that! Christy is one of my new favorite artists!). I've decided that I'll be participating in The Summer of Color each week by creating a 4x6 or 5x7 canvas board as the foundation of my piece. By the end of the summer I'll have a very colorful collection of art to display in my studio as inspiration. I'll also be trying new techniques or products in each piece to keep my creative juices fresh! Thanks for looking! Now I'm off to see what the other participants have created. Remember you can join the party at anytime and you don't have to participate every week. You can read an overview of The Summer of Color, here. Her party is called The Summer of Color. The basic idea is you check her blog every Monday to discover the color for that week. You then create art in *any* medium your lil' heart desires (she offers several suggestions on her blog), and then you post a link to your work on her blog. Posting a link enters you in her weekly giveaway. How cool is that?!? You get to make art *and* possibly win a prize just for playing along. So, I wanted to be sure to tell everyone about this awesome party so you can all join in the fun, too. Those are the basics but if you want all the details, then head on over to Twinkle, Twinkle and read all about The Summer of Color. See you at the party! Amazing Ashley of Lil' Blue Boo is donating 100% of the sales of her patterns between now and midnight of 3/14/2011 to Mercy Corps to help the victims of the earthquake and tsunami in Japan. This is a great time to purchase Ashley's super cute patterns and also know that your donating funds to a very worthy cause. You may have noticed a new button on my blog. It's the Picture Inspiration button. Picture Inspiration is a class I'm taking through Big Picture Classes. In addition to a series of weekly prompts that are intended to inspire class participants to pick up our cameras and start shooting, there is also a message board and a gallery to share our images. The class is hosted by Tracey Clark. If you've never heard of her, then chances are you've never heard of Shutter Sisters, either. You need to check out both of those sites if you have any interest in photography at all. Anyway, in Tracey's welcome to us, she discussed an inspiration tool box. This is basically the things that we surround ourselves with that offer inspiration for photography and creativity. The book Simple Abundance is part of Tracey's inspirational toolbox. I've owned this book for over 11 years. I first discovered this book in my early years as a social worker. One of my mentors used it often in her personal life and in helping the women she worked with find balance. My mom gave me the book as a gift the first Christmas after I got married. At that time, I was in my mid-twenties. While I was certainly a mature 20-something, I didn't really "get' the book at that time. I might have thought I did. But, I was never motivated to get past the first few pages of this book of daily devotions, inspirational quotes and prompts for introspection. Over the past 11 yrs I've moved that book from bookshelf to moving box to bookshelf to moving box as we've moved numerous times. I've picked it up periodically and flipped through the pages searching for something. But again, never quite grasped the message and was never motiviated to move beyond those first few pages. Well, I'm now in a very different place than I was the first time I held that book. As a wife of 11 yrs, a mother of an almost 5 yr old, and a social worker who's experienced beyond my years, I find myself feeling like something is missing. I've had a few particularly challenging weeks recently. I can point to a few things in my work life or personal life that are stressful but at the same time, I just feel like I'm in an overall "funk". Ultimately, I feel burnt out. I'm exhausted, irritable and simply a little sad. Well, last Friday night, I was feeling particularly down, and I decided I didn't want to spend my weekend being a grump. That wouldn't be fun for anyone. I was suddenly reminded of Tracey's mention of Simple Abundance, in that moment I decided to soak in a hot tub filled with bubbles and delve into this book of Simple Abundance once more. This book and it's message is exactly what I need right now. The premise of this book is that women are often depressed (on some level) because of a denial of their authentic self. Sound a little too out there? Well, think about it. When we walk around each day, as women, as mothers, as employees and we spend most of our days caring for others and doing things that are not in line with our own heart's desires, and we don't draw on our own talents, we are denying our authentic self. There are principles and exercises in this book that are aimed at revealing our authentic selves and teaching ways to live authentically. I'm still only a few pages into the book, but the reason I put it down this time, wasn't because of lack of interest. Quite the opposite, actually. I wanted some time to digest the words. 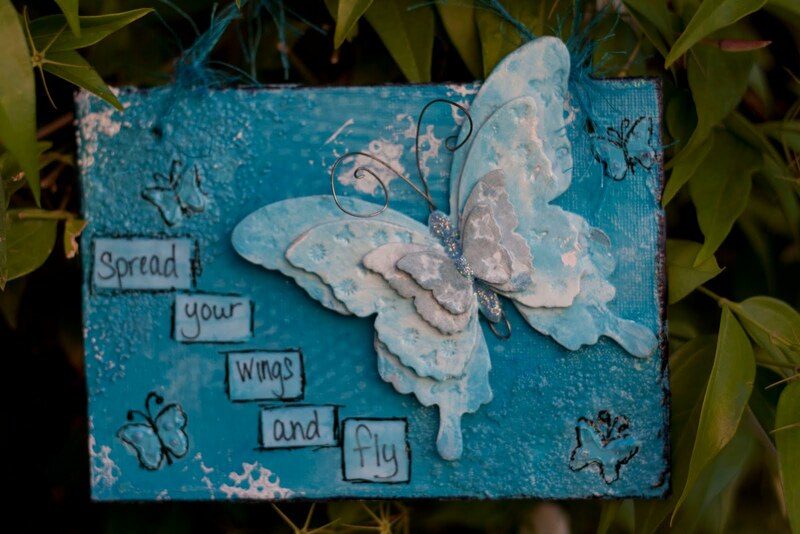 I wanted time to purchase or create a journal to be used as my companion as I embark on this journey. Now, I don't mean to come off as all melancholy. Trust me, I'm OK. I'm not going to run away or quit my job or file for divorce (my marriage is quite good!). I just know I could be more OK, more "me". I know who I am (I think) and I know what I want (I think), but there's a disconnect between who I am, what I want and what I'm actually living. I need to find more balance and bring more of what I want into my life. So, I'm sure some of you can relate to all of this. Anyone want to let me know I'm not alone? Have any of you read Simple Abundance? I'd love to know your thoughts. Check out the Crafts Unleashed blog today for my Pot of Paper Daisies Tutorial.